CARBONDALE, Ill. — A keynote presentation and a unique storytelling workshop, spotlighting the “new trad” storytelling genre pioneered by Laura Packer and Danielle Bellone, are among the highlights of October’s LGBTQ History Month commemoration at Southern Illinois University. The kick-off begins with a pride walk at noon on Oct. 1 starting at the Student Center main entrance. Led by the Saluki Rainbow Network, participants are encouraged to carry flags. That evening, Packer’s keynote presentation, “Unheard Voices: The Power of LGBTQIA Stories and Representation” is from 5 to 7 p.m. at Morris Library. She will speak in the John C. Guyon Auditorium and a reception, featuring appetizers, will follow in the rotunda. Everyone is welcome; there is no cost to attend. “Claiming Voice: Crafting, Honing and Telling the Stories of Our Lives,” a workshop led by Packer, is set for 11 a.m. to 12:30 p.m. on Oct. 2 in the Student Center’s Kaskaskia Room. Organizers say that while traditional storytelling focuses on discovering and repeating traditional tales, the “new trad” style instead seeks to uncover and highlight the stories within the story, the narratives traditionally considered secondary, and finds within them the themes and identities that still exist within the margins. The LGBTQ History Month film series features movies on the second and fourth Monday of the month. “Forbidden – Undocumented and Queer in Rural America,” a collaboration with the Hispanic and Latino Resource Center, will be shown at 5 p.m. on Oct. 8 in the John C. Guyon Auditorium at Morris Library. The documentary tells of activist Moises Serrano’s journey in pursuit of the American dream. The inspirational story puts a face on the issues as it tells of the struggles of an undocumented immigrant and gay man who grew up in rural North Carolina. It also shows how a family’s love can overcome prejudice and hate. “United in Anger – A History of ACT UP” is slated for 5 p.m. Oct. 22 in the same location. The Jim Hubbard documentary highlights the birth and life of the AIDS activist movement from the perspective of those fully involved, and it includes rare archival footage. It explores the complexities of the issue – challenging the actions of corporations, society and the government – and shows how action, civil disobedience and united action can bring about change. The Saluki Rainbow Network’s drag show, set for Oct. 27 in the Student Center Ballrooms, is always a popular campus event. The entertaining evening typically draws a full house to see performances by a variety of drag queens and kings. A wide variety of other activities are planned throughout the month, including a Coming Out Day Open Mic, support group, pride picnic, clothing swap and gender expression fair and more. SIU’s LGBTQ Resource Center, in collaboration with numerous other campus units, is sponsoring the LGBTQ History Month celebration. 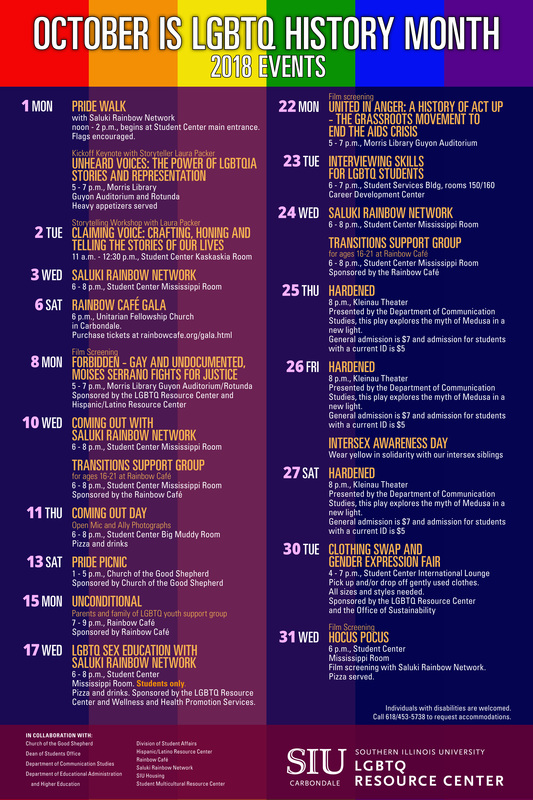 Find the complete LGBTQ History Month schedule and additional information online.